Succulents are group of plants that have fleshy leaves, stems or roots designed for storing water and allowing the plants to survive periods of drought. Whether your succulents grow in containers on a patio, as groundcovers between the pavers in a garden path or as colorful and interesting accents in a garden bed, they need a growing medium suited to their capacity for retaining water. Although succulents retain moisture well, they do still need moderate to regular watering, at least once a week or a deep soaking every few weeks during the growing season. But too much water will cause the roots to develop black stem rot, so the trick is finding a growing medium that drains quickly and dries out completely between watering. Succulents do best with soil that is normally considered poor, filled with inorganic elements, as opposed to one rich in organic material. Despite their need for well-draining soil, succulents do need some nutrients that organic elements provide. Some gardeners recommends a mix of 1 part garden soil, 1 part sand and 1 part peat moss or a mixture of 1 part potting soil and 1 part perlite. Other gardeners avoid potting mixes containing peat, remove any wood and twigs from the mix and add a coarse, gritty type of sand to potting soil. 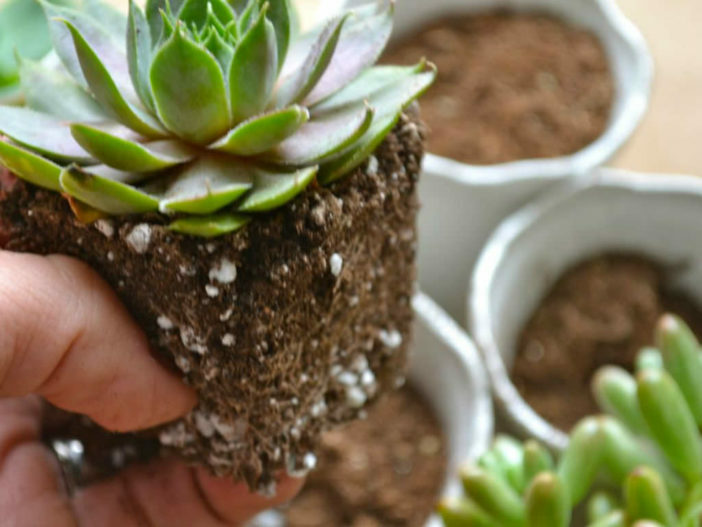 Using sand, pumice, decomposed granite or perlite as the inorganic element in your succulent growing medium is less important than simply ensuring that the soil crumbles easily and lets water flow quickly through. If your soil falls apart after you wet it and give it a squeeze, it has the right components. If it remains formed into a lump, it needs more inorganic elements added to the mix. The best soil for succulents is slightly acidic with a high lime content. If a soil test kit determines that your soil is highly acidic, your plants will benefit from some horticultural lime added to the soil. If your soil is overly alkaline, change the balance by watering with a solution of 1 tablespoon of white vinegar added to 5 gallons water. Top off your growing medium with a layer of gravel or small river rock to keep the tops of the plants dry.